being little • bristol uk fashion & lifestyle blog. : bye bye blondie. Today is my last day of being a blondie/pinkie head! For this year anyway.. perhaps I'll go back to this colour one day as it has been fun. As you can see from the photo above, all the bleaching has taken its toll, and not even Moroccan Oil or John Frieda Full Repair can save my hair now.. this afternoon I will be going back to my roots, lolz. It's really starting to feel autumnal now, so I'm having fun layering up. As we come towards the end of seasons, I always get excited for the next, thinking about what I will wear. When spring is coming I long for wearing simple pretty dresses and sandals, and when autumn is coming I can't wait for knitwear, tights and boots! I love chucking a comfy jumper on over this shirt dress from H&M, and poking the collar out. This black jumper is quite a loose knit, so not too hot for early autumn, and it dips down at the back and covers your bum. I love this. 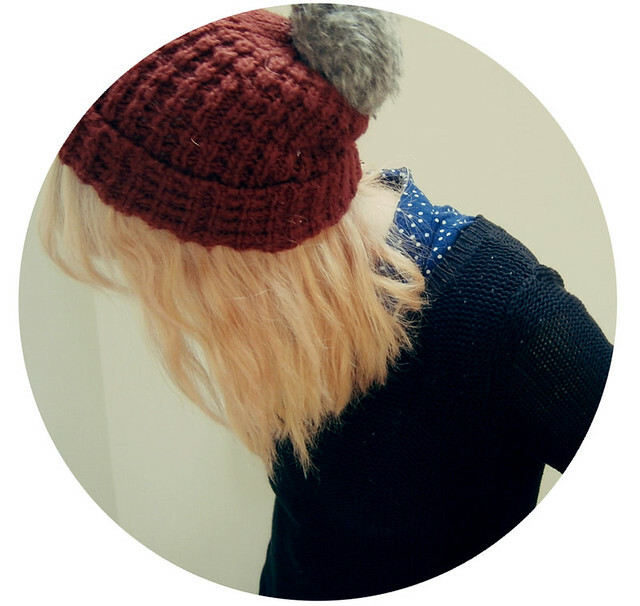 Covering up my awful roots with my trusty Topshop hat which I think I've worn constantly for the past two winters! It's the best hat I've ever had. Can you spot my drunken injury from my weekend in Bristol? Haha oopsie! Sad to see your amazing pink hair go, but your hairs health should come first! Bruises mean it was a fun night! I actually love the colour of your hair at the moment but I remember what my hair was like when I had really blonde highlights so I get why you're changing back. Love the dress and jumper combination, it's my go to staple at the moment. So easy and autumnal I love it! such a lovely combo, the polka dots dress and the jumper! Best outfit. Hat is super cute. Can't wait to get my first jumper of the autumn out!! love your hair though! where's this jumper from? WANT! Ahhh that chunky knitted jumper looks ultra cosy and warm! Nout wrong with wearing a hat for 2 weeks - it looks good! 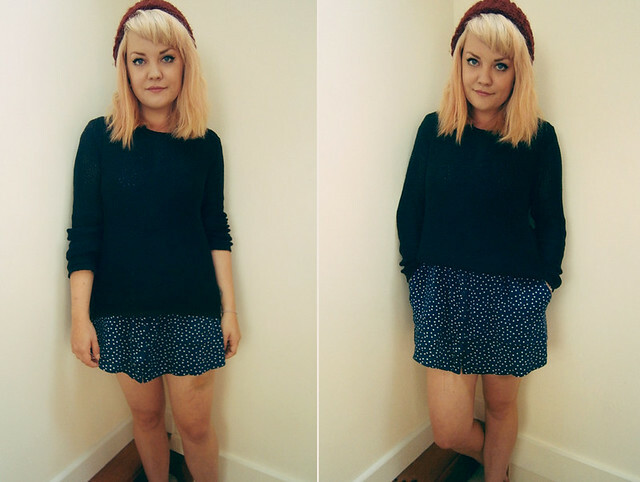 You look lovely, love your beanie and how you've layered the jumper over the dress.. such a cute outfit. It's be sad to see the blondey pink go but you gotta keep your hair healthy. I began dying my hair brown back in about March after having it bleached for a couple of years and it being in such bad condition. It just looks so much better now. Love that hat! 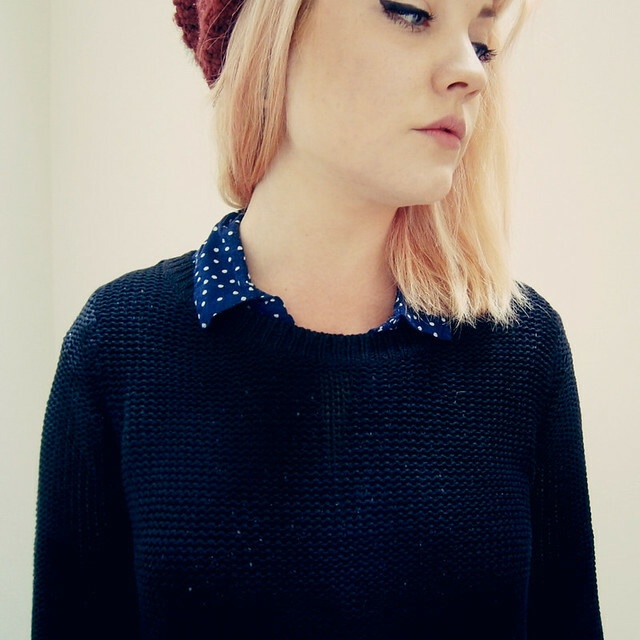 I have been lusting after some new beanies recently, better start the hunt! I am excited with the prospect of layering on the horizon (and Christmas weather of course) good luck with your hair I'm sure it will look perfect!